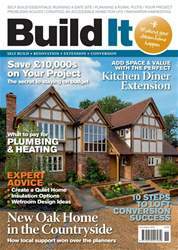 From reading Build It I’ve learned that self building can be a really cost-effective route to home ownership – not least because it’s zero-rated for VAT. However, for first-timers like me, it’s still difficult to get the funds together to finance the whole project and only reclaim this tax at the end. Surely if the government wants to encourage more people to create their own homes, it would make sense to free up the cash currently spent on VAT for use during the scheme itself. For some people, this simply means they have to aim lower when it comes to specifications. But for many, it could be stopping them undertaking a home building project in the first place.